This last week offered many new blessings as Spring really arrived and we waded into the thick of planting and carrying projects forward. One challenge since we arrived has been transportation, as we’ve all be sharing one car. The farm is a bit of a trek from town, so any time we want to go anywhere we had to organize a whole constellation of new details. We’d been crunching the numbers to see if we could afford to buy a cheap used car, but car ownership here is a least twice as expensive as in the US. At the same time, we planted many of the seeds left over from years past, figuring that even if they germinated poorly we could fill in the gaps with new starts or other seeds. We reused a lot of pots and pallets and materials from previous years as well, figuring that at least we would try to get something. 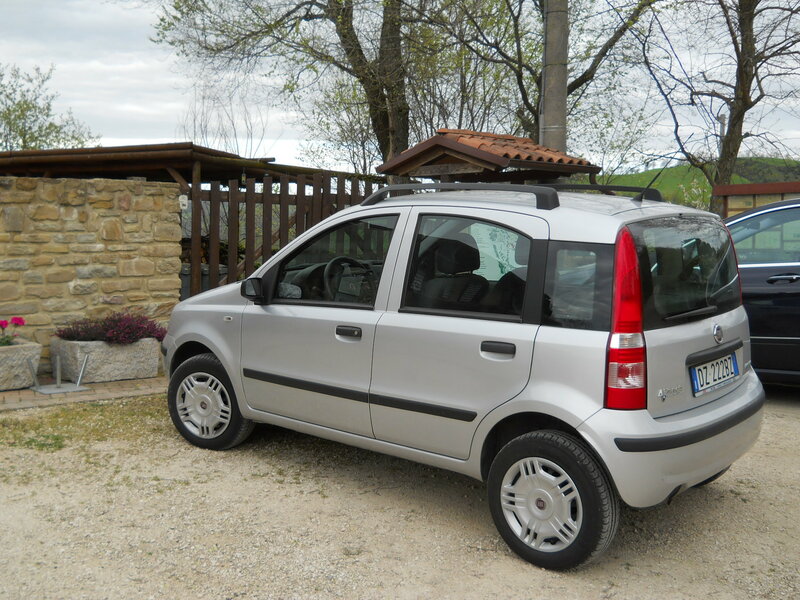 Imagine our surprise when just as the seeds started to sprout this week, Federica’s aunt Daura offered to give the family her car. While we welcomed the new sprouts with no apprehension (maybe a little because we’d overplanted some of the plots expecting very poor germination) we were overwhelmed by the generosity of Daura’s offer. She is a really generous and loving person, who has hosted many of my English-speaking family members on tours of her native Ravenna with language skills she learned from years in international business. She would not take our no’s for an answer, and just yesterday we brought up the little car that she has kept in immaculate shape and has fewer miles than any used car I have ever had. The sprouts will continue to grow and we continue to feel surrounded by love and blessings. 2009 Fiat Panda- with natural gas and only 27,000 miles! 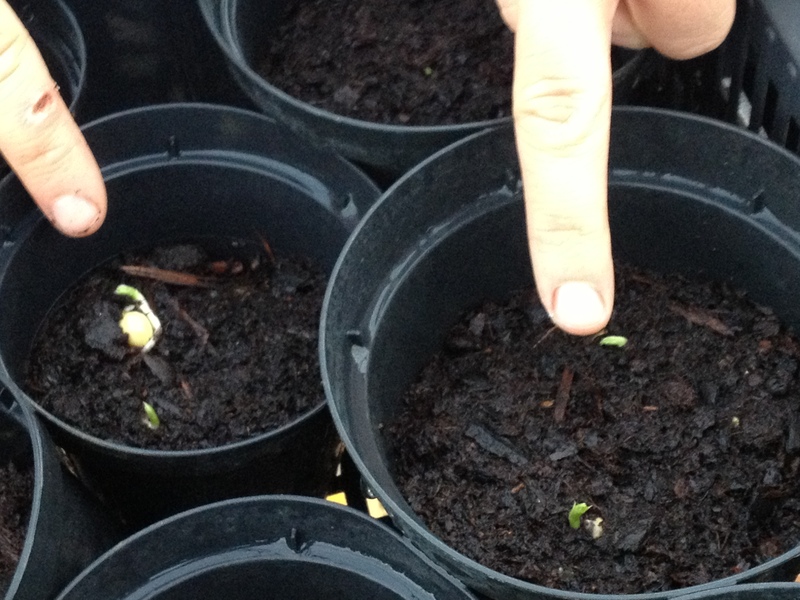 Dwarf pea sprouts, on their first day above ground. Happy to hear your good news my dears. May your good luck and the bounty continue. Cool! The Panda in its many iterations has been a great car. Irish friends of mine toured much of the western world in one for charity. I hope this one works well for you. It’s the favorite car of the country gentleman around here. This is a newer model (2wd), but they say that if you see some of the 80’s era 4×4’s on the roadway, usually forest service green, driven by an old man: watch out. If he’s wearing a hat and weaving a bit, double caution: he’s probably drunk, even if it’s 10am. Peas! I’m pleased to see peas! thinking of you. They’re the first out of the gate. We’ve been thinning some of the melons and squash this morning, and there are hints of the tomatoes, peppers, eggplants, and watermelons germinating too!